Map illustrating land acquired through the 1803 Louisiana Purchase Treaty between France and the U.S. (shaded red). 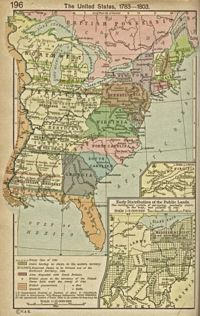 Map of the United States prior to the Louisiana Purchase. 1803 marks the year the Haitian troops finally prevail, and repel attempts by Napoléon Bonaparte to re-establish slavery in Saint-Domingue. In 1802 the French General Antoine Richepanse had re-instituted slavery in the Caribbean colony of Guadeloupe.These events were followed with terror in Saint-Domingue. 1803 is the year of death of Toussaint Louverture, the leader of the Haitian Revolution. February 2 The poem To Toussaint Louverture by Wordsworth is published in London. Death certificate of Toussaint Louverture. April 7 Toussaint Louverture dies in French captivity at Fort de Joux. April 8 Toussaint's post-mortem examination is carried out. 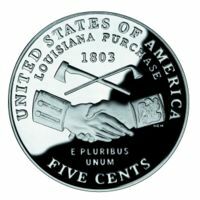 United States coin commemorating the bicentennial of the Louisiana Purchase. April 30 The Louisiana Purchase Treaty is signed. 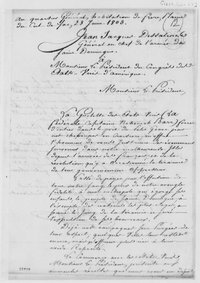 This treaty, giving up much of France's colonies in the Western Hemisphere, is directly related to the Haitian Revolution, as France put a tremendous amount of resources into fighting the troops of Jean-Jacques Dessalines in Saint-Domingue and therefore had to cut back in other regions. The current Haitian Flag, based on a design created at the Congress of Arcahaie in 1803. May 14 The Congress of Arcahaie starts in the coastal town of Arcahaie. May 18 The Haitian Flag is created by Catherine Flon. June 1803 letter by Dessalines to Thomas Jefferson. On June 22 the Haitian revolutionary Jean-Jacques Dessalines sends a letter to U. S. President Thomas Jefferson. On October 20 the United States Congress ratifies the The Louisiana Purchase Treaty. November 18 The Haitian Revolutionaries led by Jean-Jacques Dessalines win the Battle of Vertières against the French troops commanded by Rochambeau, who soon after concede defeat. November 19 one day after the final battle of the Haitian Revolution, Rochambeau capitulates. November 30 Jean-Jacques Dessalines becomes the Governor General of Saint-Domingue, he holds that post until the Declaration of Independence in 1804, when the French colony ceases to exist. The last French troops leave Saint-Domingue. The Haitian Declaration of Independence is drafted into it's final version. January 1, 1804 is chosen as the date to declare independence. Note 1: A man-of-war refers to an armed naval vessel. Antoine Richepanse. (2006, March 5). Wikipédia, l'encyclopédie libre. [Accessed 18:20, March 15, 2006] . Léger, Jacques Nicolas. Haiti Her History And Her Detractors. (1907). The Neale Publishing Company. New York. available online - Accessed on August 15, 2007. This page was last modified on 20 April 2009, at 11:23.